As crazy as it sounds, this is one of my life saving dishes. Not so much in the literal sense, but when time is tight, I’ve leaned on this dish more often than I can count. It’s perfect for days when I’m running late for a friend’s dinner and I’m in charge of bringing nibbles. Or times when I’m on the brink of hanger and dinner still feels like it’s light-years away. Regardless of the occasion, a quick dose of protein is a great way to keep hunger at bay. Edamame on it’s own, while delicious, rarely comes across as impressive. That said, these freezer aisle veggies deserve some more love if you ask me. And it doesn’t need to be complicated. This recipe is the perfect example of how a little can go a long way. 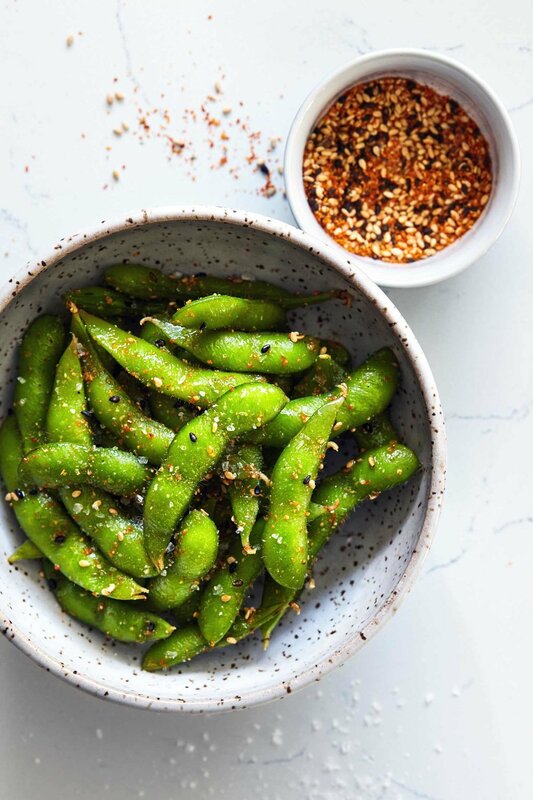 Fragrant sesame oil and Japanese spice can transform these humble beans into a portable and satisfying treat, whether you enjoy them at home or share them with others. Shichimi Toga-what?! 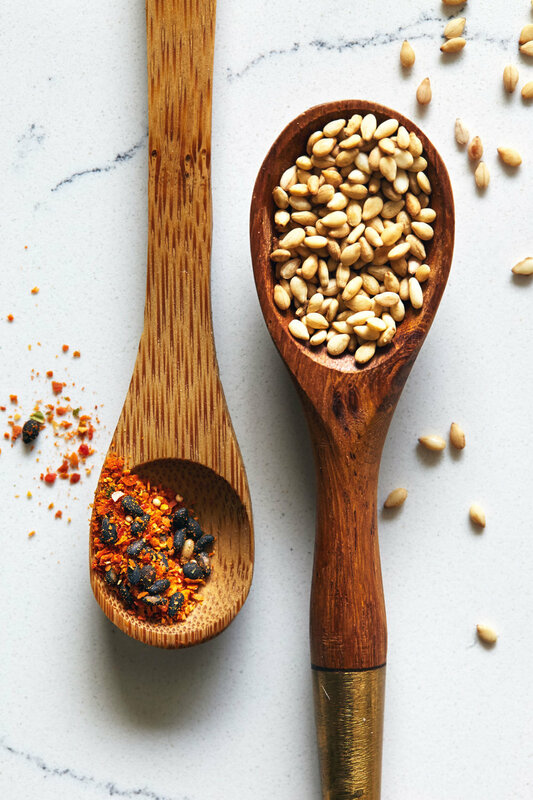 If you’re unfamiliar, Shichimi Togarashi is a highly versatile Japanese Seven Spice blend, which can be found in the Asian aisle of most grocers. I call it magic dust, but it’s actually made from chili, sesame seeds, citrus, a hint of seaweed and a few other savory ingredients. You can make your own from scratch, but I’ve always found that the pre-mixed shaker bottles are an easy way to always have this spice on hand. A word of warning: there are a few variations of this Japanese-style spice (some of which are a lot spicier), so be sure to read the label and start with a small amount. It’s easier to add spice than to take it out. Trust. This dish will come together in minutes, so for a sub-10 minute cook time, be sure to have your flavorings pulled out and set aside. Simply boil the edamame beans for ~5 minutes (or until tender). Toss with toasted sesame oil, Shichimi Togarashi, extra sesame seeds and salt. You can serve right away, but they’ll absorb even more flavor if you let them sit for awhile (leftovers for the win). You can serve warm or cold, whichever you prefer. Extras should be stored in the fridge. Enjoy! In a pot, bring 2L of water to a boil. Once boiling, add frozen edamame beans to the water and cook for ~5 minutes or until tender. Strain immediately. 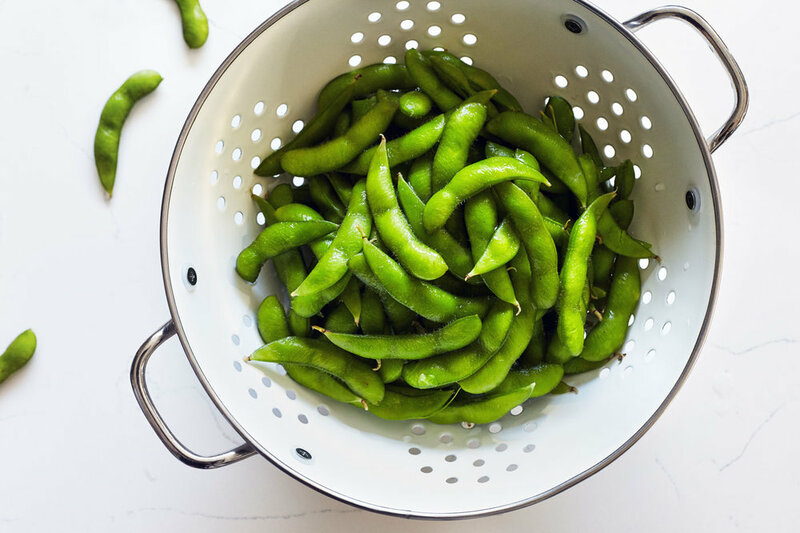 Add edamame to a bowl and mix with toasted sesame oil. Sprinkle with Shichimi Togarashi, sesame seeds and coarse salt. Toss until evenly coated. Enjoy at room temperature or cold. -*Start with a smaller amount, and add more to suit your taste.